When Lewis and Clark stopped at this spot on September 15, 1806, atop a high bluff with a sweeping view of the Missouri River Valley, they noted that the site offered a "commanding situation for a fort." Today, this spot is in downtown Kansas City - Clark's Point. 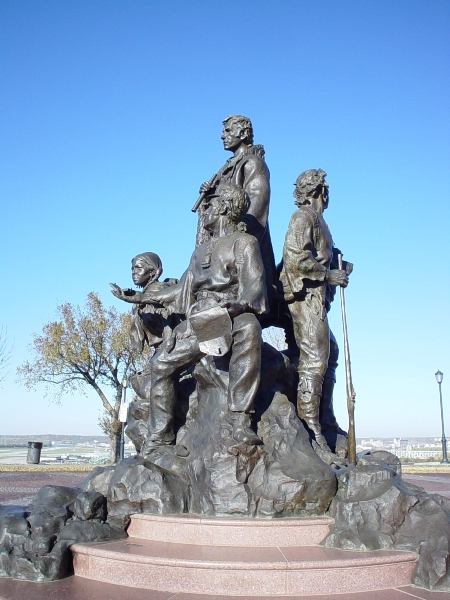 The sculpture depicts Lewis, Clark, York, and Sacagawea holding her baby Jean Baptiste and Seaman (Lewis's newfoundland dog). Eugene Daub, one of America's leading figurative sculptures, created the work.